This one is an oldie. In fact, almost five years passed since this was released on Merzbau. Unfortunately, enough time for the netlabel to shut its doors - the website is still on and will be for long, so make sure you stop by and listen to the other records. What is truly remarkable on “Canções da Lua Nova” (in portuguese “Songs of the New Moon”) is that these eleven songs (and an outro) were in kept in a drawer for over thirty years. 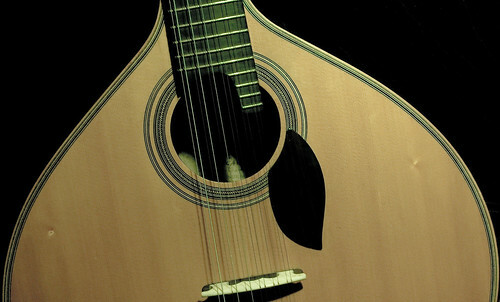 This is an unbelieveble instrumental fado music collection hidden for too long. Although Alexandre Bateiras has always been a portuguese-guitar player – he plays since he was 15 -, he was never concerned about releasing new songs. Well, it was only due to his son's persistence that the tracks saw daylight. Please make notice to the fact that you're not listening to music only, you're listening to the stories that were left behind on Alentejo's plain (South of Portugal). Most of the songs names are real places names. And those that are not still have something important to remind us. For instance, “Tributo” is as tribute to a soldier who died during the portuguese colonial war back in the 60's. Alexandre Bateiras was there, whitnessed the moment and was able to show us what happened with a few chords.